Natural Latex Foam mattresses, dunlop & talalay process. Natural latex foam is processed Hevea milk (rubber tree sap). It's rare to find 100% natural latex in brand name mattresses since it's expensive and durable, lasting 15+ years. Big box companies will usually only include 1 - 2 inches of 100% natural latex on top so they can promote the mattress as “natural”. In reality, the bed is made up of more synthetic materials than anything else. Be suspicious when companies don't mention the percentage of natural content in their latex. Keep in mind that it's just not feasible for any mattress under $2000 to be made entirely of 100% natural latex due to the costs. Still a real latex mattress, just produced synthetically, a great product and at a little better price. Can be very durable. Dunlop latex and Talalay latex are not two different kinds of latex. Instead, they refer to two different processes used to make latex. Both processes can be used to make natural or synthetic latex or blended latex. Both processes produce latex with the same options in firmness, despite some claims that Talalay makes a softer latex. Latex firmness is measured in ILDs, Impression Load Deflection. In other words, how many pounds does it take to compress a four-inch piece of latex one inch or 25%? Since both Dunlop and Talalay processes can be measured, the firmness between two pieces of latex can be exactly the same. The real difference is durability, price, and response. Let’s start at the beginning. Latex is harvested from the Pará rubber tree (Hevea brasiliensis). The harvesting begins when the tree reaches between 5 to 7 years old. A thin slice of bark is peeled away to release the latex, which then drops down into a cup, a process similar to maple syrup tapping. Unlike maple syrup, the sap is not taken from the growing center (cambium layer) of the tree as that would kill the tree. Instead, the flesh wound does not reach as deep as the sap. The cut releases what we call latex or gum rubber or India rubber. Harvesting of natural latex occurs quite regularly, but is spaced out so as not to stress the tree. There are generally only two months out of the year that a mature rubber tree is not tapped – the dry season, when the leaves fall off. This resource explains in detail the timing of the day and spacing out of the tapping, the exact methodology, and the expected harvesting life of the rubber tree plantation with diagrams and text. After the sap is collected, it is cooked to concentrate it and remove the extra liquid. From there it is processed either Dunlop style or Talalay style. 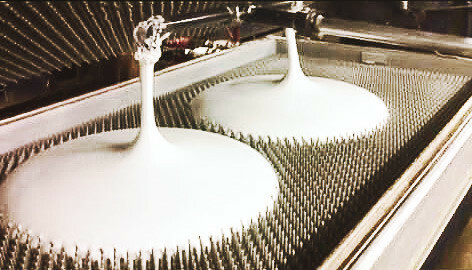 The Dunlop process of latex, in brief, is to froth the latex in a centrifuge, then pour it into a mold. There it steam bakes for about 30 min before it is rinsed and cooled. The Dunlop process has been around since about 1929. See Below to view an informative video on Dunlop process latex. Talalay processed latex starts similarly with the frothing, but when the mold is filled, it is only filled ¾ of the way, vacuum sealed, then pumped full of air. It is mixed, flash frozen to suspend the tiny air bubbles while they’re still evenly distributed, then baked, rinsed and cooled. Both processes result in a piece of latex with small pin cores. The molds are set up like a waffle iron with pins protruding from the top and bottom. These pins help evenly distribute the heat so that the piece does not get scorched. Every once in a while, you’ll see a tiny yellow spot in the middle of a piece, which is a scorched spot; these spots are cosmetic and do not affect the performance of the latex. Talalay boasts that the cell structure of their cells is more consistent than Dunlop’s. However their weakness is actually the air; the more air, the shorter the life of the latex. This addition is why soft pieces of Talalay latex have been known to get body imprints in as little as five years or so. Dunlop’s weakness is not its durability but its lack of perfect uniformity. Because it is not flash frozen, the latex has time to settle toward the bottom of the mold. The bottom of a 6” core of latex can be slightly heavier than the top. Delivering our latex in 3” slices helps to keep the firmnesses of the slab consistent. The extra process of the flash freezing also raises the price of the Talalay latex to an average of $200 more than a Dunlop piece. All of the Dunlop latex produced is a fast response latex; meaning it bounces back when the pressure on it is removed. Talalay processed latex can support both fast response and slow response latex, a similar enveloping feel to memory foam’s feel. We stock primarily Dunlop processed latex. Queen size set-,on up to $1995.- all sizes available. Firm, Medium, and softer. We will make a quality Latex mattress your way! As a mattress designer; I love the durability, versatility and buoyant comfort that real blended latex imparts. Stretch knit Bamboo cover for comfort transparency. The foam stocks are produced in the USA. The finished mattresses are designed and made in the heartland, by Sterling Mattress. Come test drive your choice of latex mattress today! $1,349.00 Queen size set-,on up to $1995.- all sizes available.